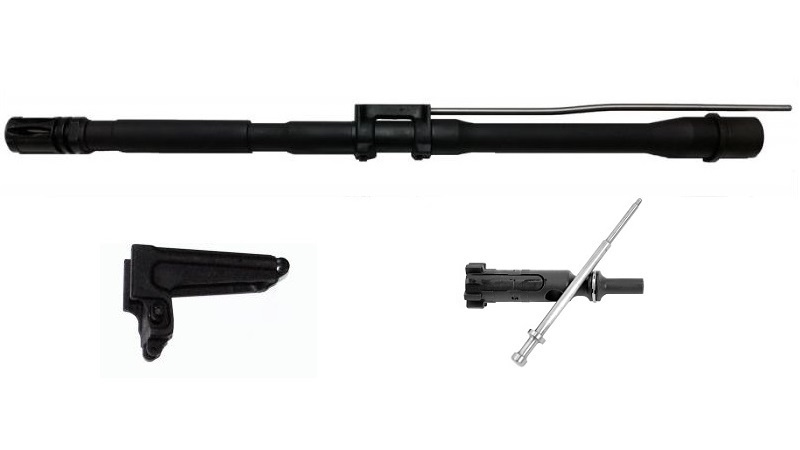 This Conversion Kit for 7.62 x 39 includes 16-inch 7.62 x 39 Barrel with a Low Profile Gas Block, the MGI® Enhanced 7.62 x 39 Bolt and Firing Pin (EAK), the MGI® D-Fender D-Ring for increased reliability, and AK Mag Well. This Conversion Package is designed to use standard Warsaw Pact metal magazines and Thermold polymer magazines. All Conversion packages are test fired prior to packaging. Connecticut, California, Maryland, Massachusetts, New Jersey and New York Residents are REQUIRED to select State Compliant Options. For Maryland and New York Residents, the Barrel Assembly will be substituted with a Bull-Nose Barrel with a Low Profile Gas Block. State Compliant Options is required. Out of Stock. Please call us at 207-817-3280 for more information. based on weight and shipping destination.